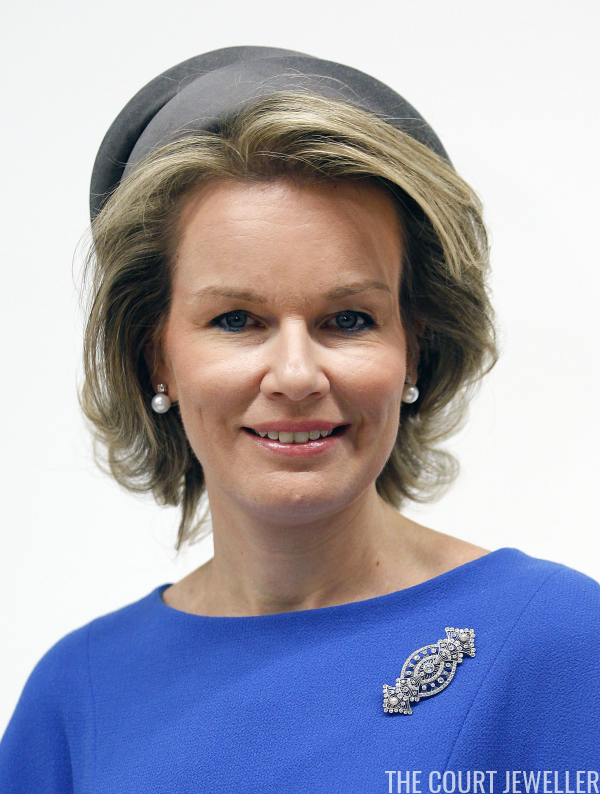 One of my favorite brooches from the collection of our magpie of the month, Queen Mathilde of the Belgians, is today's piece: her diamond and pearl-studded brooch. 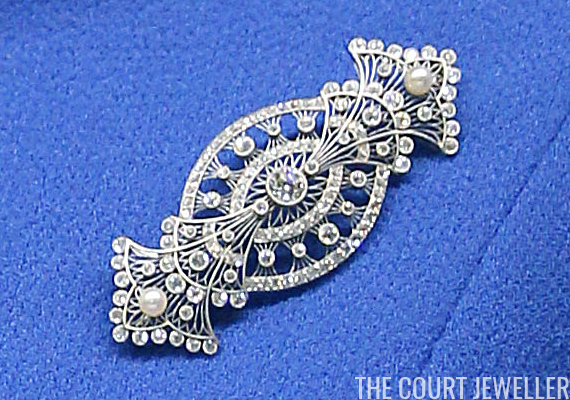 The brooch is delicate and complicated. The lens-shaped jewel has lacy, fan-like end sections. The center of the piece features a larger round diamond set in its center, and round pearls are set at either end. Mathilde has worn the piece both as a brooch and as a hair ornament. 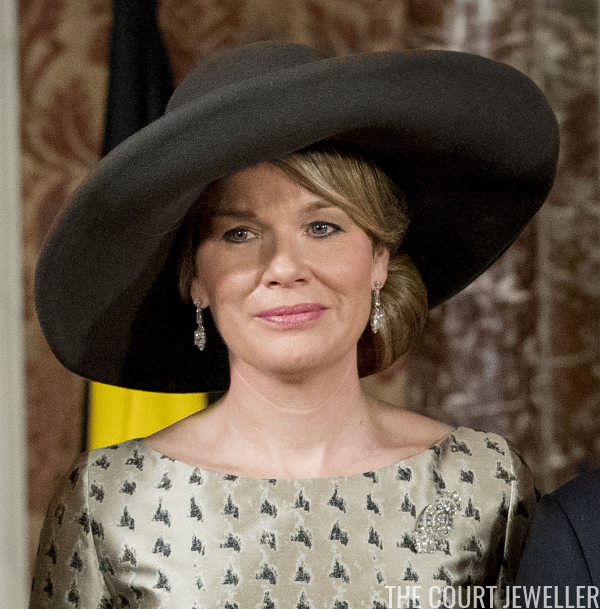 Mathilde first wore the brooch in public for an EU reception on January 20, 2015, which also happened to be her birthday. Because of the timing, I've read speculation that the piece might have been a birthday present. The brooch was lost a bit in the print of her dress in that initial outing. The same problem happened in November 2016, when she wore the brooch against a silvery printed dress during a visit to Amsterdam. On other occasions, she has worn the brooch against bolder colors, as she did during this visit to Paris in October 2016. 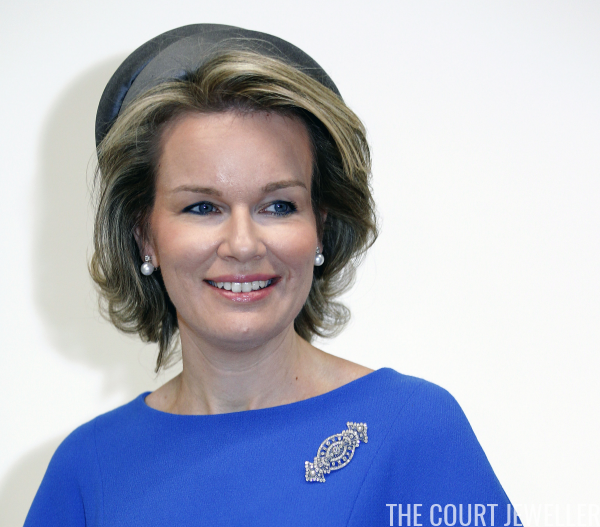 On that particular occasion, her vibrant blue dress served as an excellent background for the details of the brooch.